It is delivered on 16 GB a high-speed USB-2 sturdy chrome & leather flash drive, in it’s own metal storage box. It contains files only, as described below. 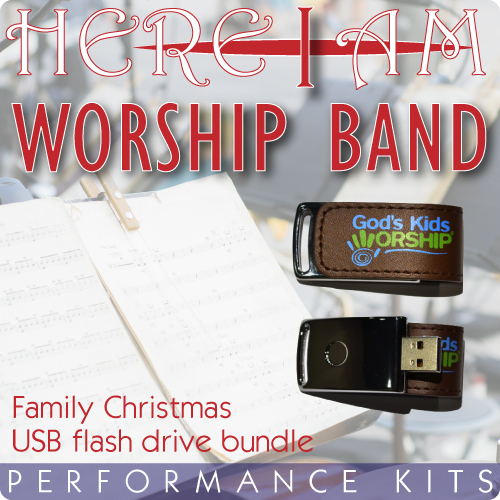 The album contains a variety of songs that make Christmas more meaningful, from new, pop-infused high energy worship opener songs, to jazzy, R&B inspired arrangements, and new, thoughtful updates to well-known Christmas favorites, sure to reach across generational and denominational boundaries. All 11 songs from the album are included, with performance-oriented individual components described below. All videos in this project use the twinkling lights background theme to unify them and fit into Christmas-themed holiday events. Videos - 3 lyrics videos in HD 1280x720 H.264 .mov format: full mix, tracks mix, click & guide. Vocal Charts - Individual pdf charts for melody vocal/lyric sheet, and group vocal parts, kids chorus parts, and counter melody or harmony vocal (duet) parts, if any.